Pass out 2 pieces of cardboard, 4 bottle caps, glue and gluesticks. 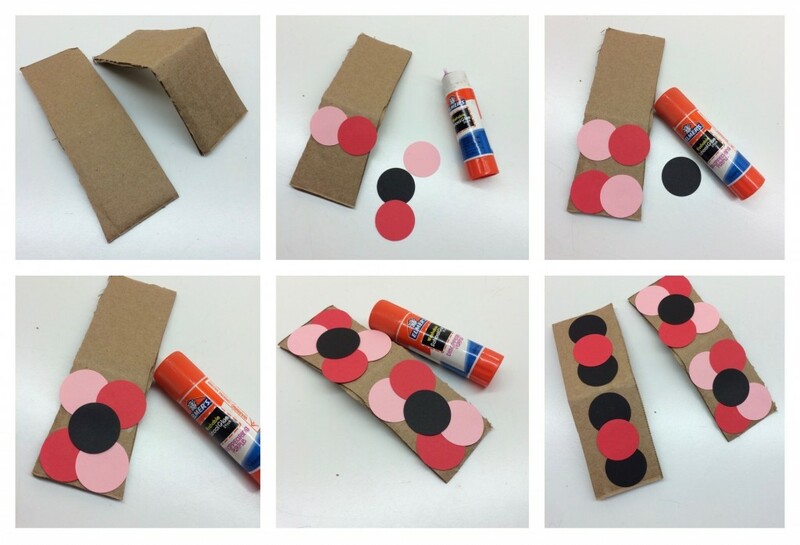 Step 1 (fold & decorate castanets): Fold cardboard pieces in half, then unfold to decorate. 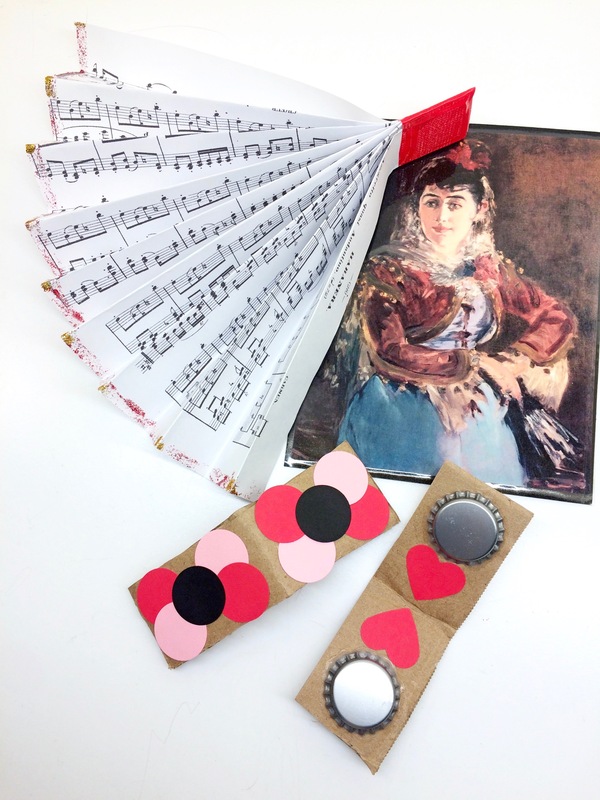 Use small pieces of paper or paper cutouts to decorate the top of each castanet. *Keep in mind, our castanets will be drying decorated side down so be careful not to use too much glue. Now we’re going to glue bottle caps to the inside of our castanets so when we close them, they make a clicking sound. Step 2 (glue bottle caps to castanets): First, put a line of glue around the inner rim of each bottle cap and press onto your cardboard, holding in the correct position for a few moments. This is the tricky part! We careful not to let the bottle caps slide. 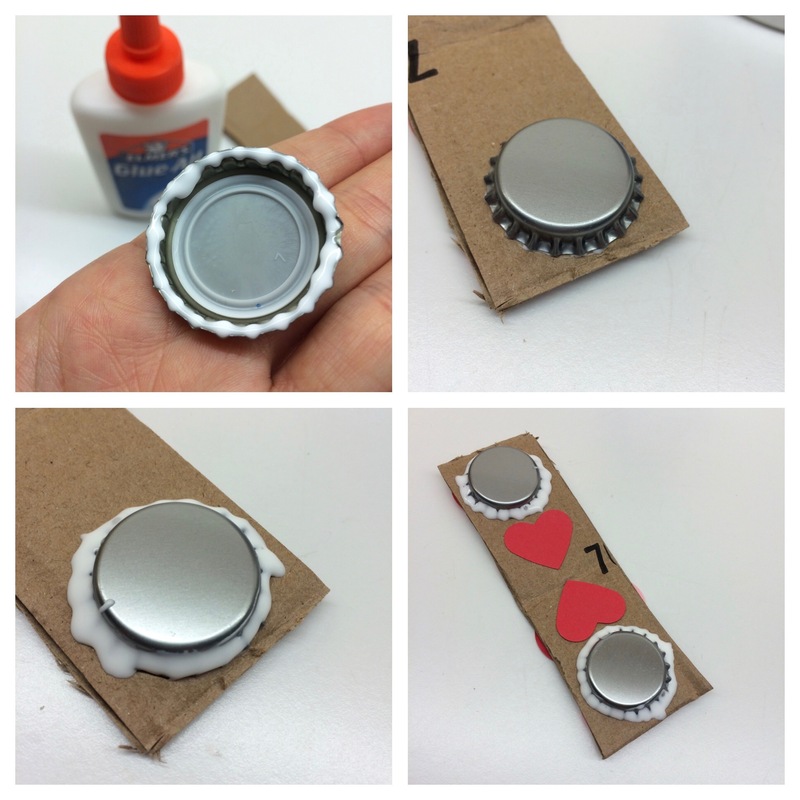 Once they’re stuck in place, line the outer edge of each bottle cap with more glue to seal. You could also put a couple small decorations on the inside of your castanets! (I used a heart on each side!) Set aside to dry, bottle cap side up. 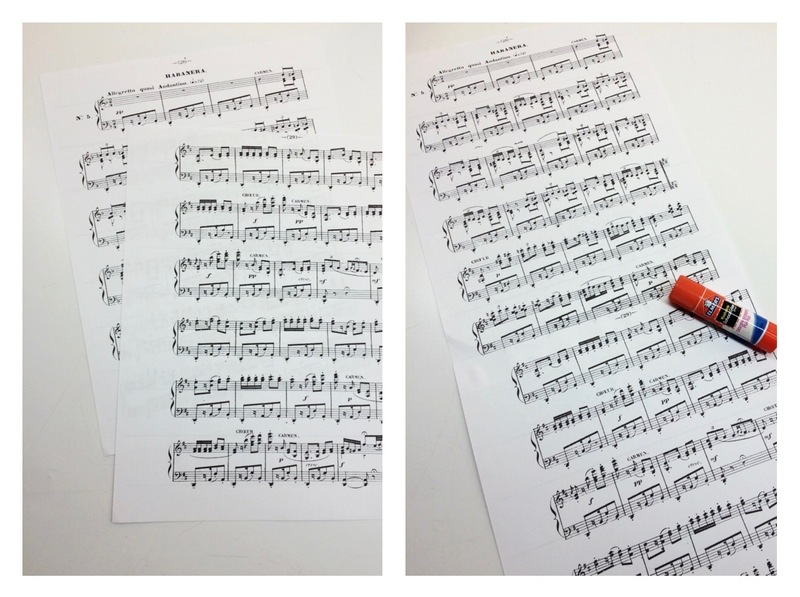 Pass out sheet music and glue sticks. Tell students: this is the music from Carmen! What do your students see on the paper? (Notes, symbols, words) Let’s turn our sheet music into a fan! First we need to attach 2 pieces of music. 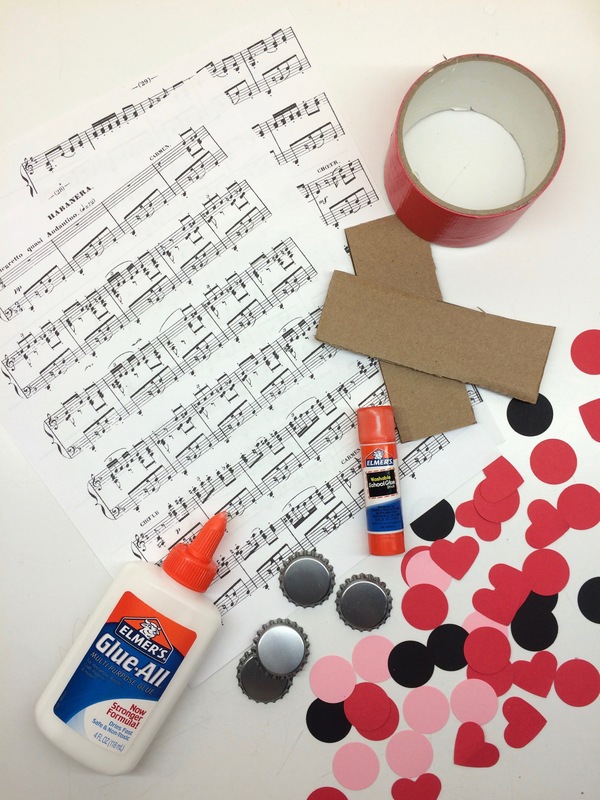 Step 3 (glue sheet music piece together): Use a gluestick to glue 2 sheets of music together along the short end. Now, let’s make the folds in our fan. 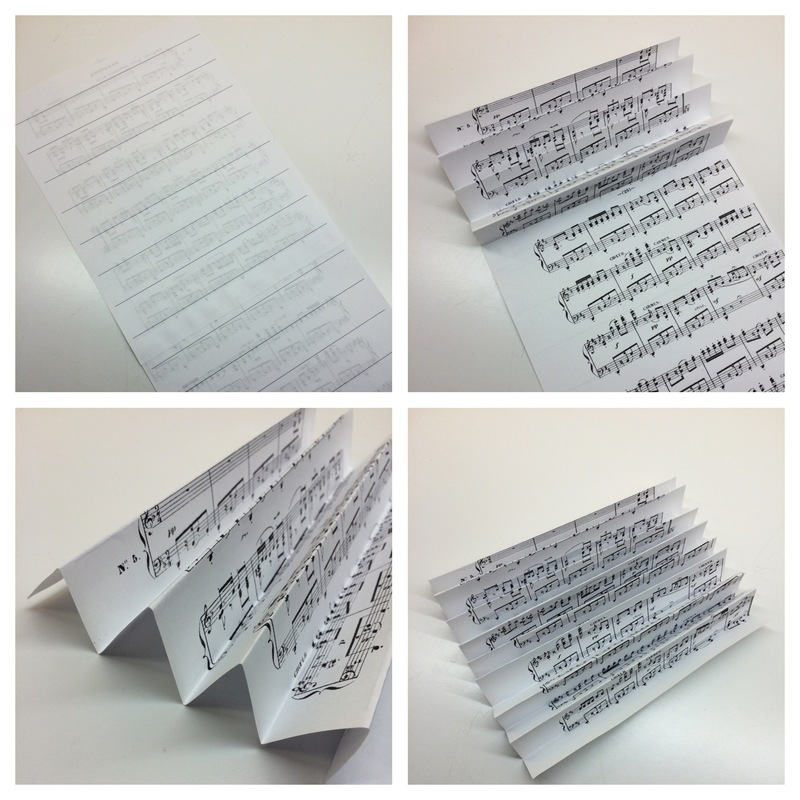 Turn sheet music over and, using the lines as a guide, accordion fold from one end to the other. 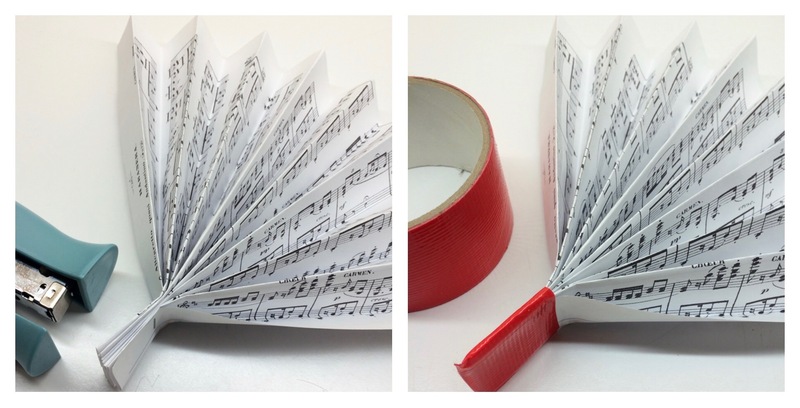 Slowly explain how to make accordion folds in paper and ask adults to help children! Step 4 (accordion fold along lines on back): Accordion fold from one end to the other. Our fan needs a handle! Step 5 (staple & make a tape handle): Pinch together one side of your paper and ask an adult to help you staple together. Next, wrap tape around the stapled end to create a handle! We used duct tape, but any tape will work! Step 6 (decorate top edge of fan): Paint with your glitter glue at the top edge of your fan! *Use a light coating so fan isn’t weighed down. 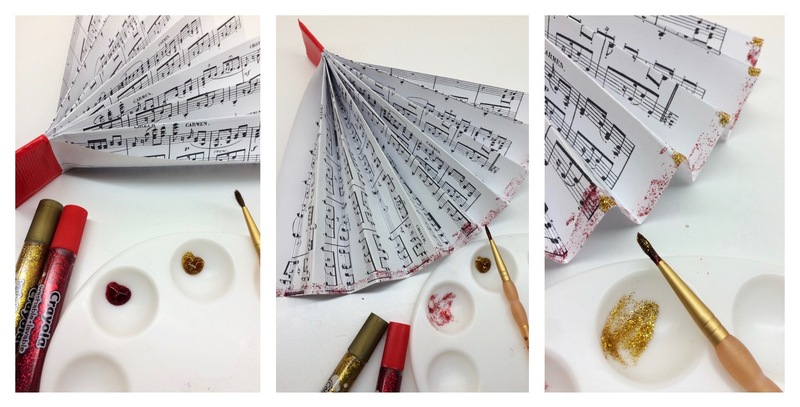 Finished Castanets & Sheet Music!